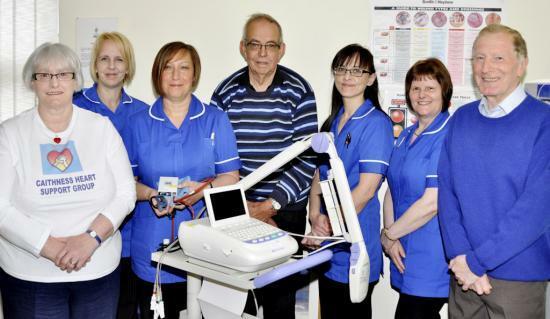 CAITHNESS Heart Support Group handed over the latest items of medical equipment it has funded. Wick medical centre's Riverview Practice received an ECG machine and the Pearson practice, a blood pressure monitor and a pulse oximeter. The equipment, costing a total of almost £6000 was handed over to nursing staff recently. Pictured are, from left to right, are, group member Janice Macgregor, nurse Eleanor Lee, nurse Mahri Swanson, group chairman, Ernie Ross, nurses, Laura Stewart and Jennifer Martin and group member Robin More. Guest speaker at a recent Caithness Heart support Group AGM was local Highland councillor Nicola Sinclair who gave a thought-provoking address about health services in Caithness and the challenges facing them and the NHS. Cllr Sinclair is well placed to speak to groups about health service having been a founder member of Caithness Health Action Team (CHAT) and still involved in the campaigns over Caithness health issues. Caithness Heart support Group AGM. Guest speaker was local Highland councillor Nicola Sinclair who gave a thought-provoking address about health services in Caithness and the challenges facing them and the NHS. A TRIBUTE was paid at the AGM of Caithness Heart Support Group, recently, to long-serving chairman Ernie Ross, standing down after nine years service. Highlighting Mr Ross's contribution, the new chairman, Noel Donaldson said: "Ernie has not always enjoyed the best of health but has always given us a one hundred percent commitment to the group and that has been greatly appreciated." However, Mr Donaldson was pleased to add that Mr Ross was not severing his connection with the group but has decided to remain as a committee member. Caithness Heart Support Group handed over the latest equipment it has funded, to the medical practices at Wick GP surgeries. 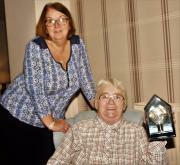 Accepting an ECG machine from group member Janice Macgregor (right front) is Pearson practice nurse Shirley Macleod. THE renovated croft house at the top of Newtonhill will be the focus for an illustrated talk by volunteers who are hosting it on behalf of Caithness Heart Support Group. The historic croft house dates back to the 18th century. CAITHNESS Heart Support group recently bade a fond farewell to its patron Miss Anne Dunnett who retired from public life recently. The group was only one of several local organisations Miss Dunnett was involved in, not least as the county's Lord Lieutenant. THE Thurso and Halkirk joint GP practice was delighted to receive much-needed replacement items for the surgery. An examination couch, heavy-duty, electronic scales and four pulse oxometers, were funded by Caithness Heart Support Group. LOOK OUT your dancing shoes!...the Caithness Big Band is swinging into town next week. The musicians are again playing for the Caithness Heart Support Group, at Mackays Hotel, Wick, and it promises to be quite a night. MOST of us enjoy a good story and here's an opportunity to hear a few of them. Caithness Heart Support Group's latest speaker is Eric Farquhar who will be delivering a selection of fascinating tales at the Norseman Hotel, Wick on Wednesday night - 4th November 2015 Group press officer Noel Donaldson said: "Eric has a great way of delivering these stories and I am sure it will be an entertaining evening." The story-telling starts at 7.30 pm in the Norseman's Heron Room. THE Town and County Hospital's Newton Wing, at Wick, now has an ECG facility which will enable patients to have their hearts checked on-the-spot, without having to visit the town's Caithness General Hospital. The hi-tech box was funded by Caithness Heart Support Group and handed over, recently.